5. Mungo Crafts in May. Mungo Crafts is always awesome but in May they will be donating 3 cans of food to a local food bank for every hoodie sold. If you have been eyeing up a Mungo hoodie, May is definitely a great time to buy one! I love mine so much! Cinemagraphs are really beautiful and I want to try out this tutorial to make one! Violet's blog is really awesome and so so pretty. 3. Rachel's dining room and DIY table. I very much like Rachel's decorating style! I always think that I want white walls but once I have them I just can't deal with the lack of colour and end up painting something bright. I loooove looking at how other people decorate with white walls though! 2. Best set of utensils ever! I'm pretty sure my kitchen could use something this cute. 1. Best cat toy ever. Ummmmm. Yes. 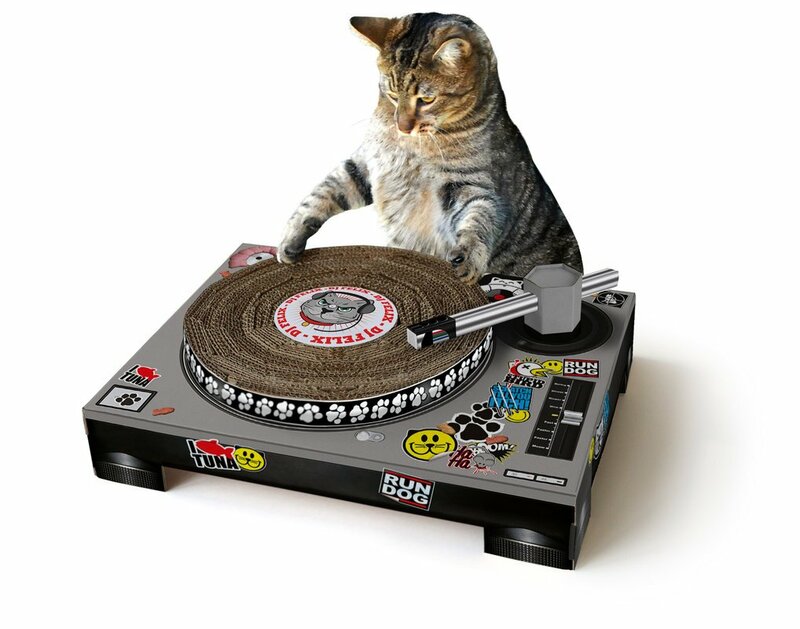 Just thinking about our kitties playing with this is making me crack up! Today, weather permitting, I plan on tackling the dandelion factory that is operating on our front and back lawn. They are out of control! Also, last night I grabbed some records from my mom's house including a bunch of Beatles ones and I am so excited to listen to them all! Now instead of listening to the same 5 albums on repeat we have a little more variety. Oh my word, that cat toy kind of makes me wish I had a cat. Best dining room ever, I love the simple colour scheme! oh my goodness!! That cat toy is AWESOME!!! Congrats on the great ModCloth post! You made Toronto look like so much fun! I can't afford to make cinemagraphs any other way other than using the app cinemagram,but I love it. The sad part is EVERYONE I show it to thinks it's "creepy". I think they are awesome. I gotta get my paws on that cat toy! Did you know that rabbits love dandelions? Well, mine does. Haha the cinemagraph totally freaked me out! I just kept staring at her waiting for a blink, an eye twitch, something! =D These will take some getting use to but what a crazy fun concept!